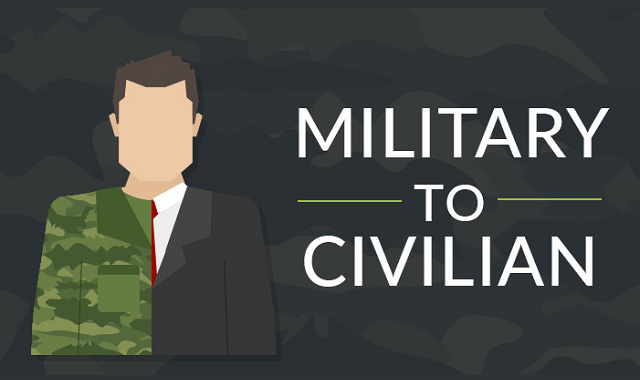 Military To Civilian #Infographic ~ Visualistan '+g+"
After coming to the finish line and feeling the transfer to the civil life, the former military men get the awkward feeling of not being proficient on the labor market. Totally specialized skills and strict life rules occasionally make the employers evaluate the former soldiers dishonestly and prefer totally civil workers to them. This infographic reveals the most common problems of the vets and shows the methods to omit difficulties and transform yourself to the competitive and civil worker. The trouble of incorrect appreciation of veteran skills leads to many dreadful social disorders like unemployment, homelessness, and segregation via social status. Due to possible military stresses, employers consider psychologically unstable and dependent from their past. In spite of the perfect military skill of executing the orders and, at the same time, perfect ability to act in the stressful and unpredictable situations, employers predict the lack of creativity and independent thinking. The aim of this infographic is to ruin these myths of this problem and reveal the truth about the qualities and abilities of veterans.